Florida State freshman Clint Bowles will join Bob & Mike Bryan, James Blake, Tommy Haas and Mardy Fish at the Delray Beach International Tennis Classic. Clint earned his wildcard by winning the USTA Boys 18 National Claycourts, also held at the Delray Beach Tennis Center in Florida. Tickets are available at YellowTennisBall.com. American girls Grace Kim, Kyle McPhillips and Chanelle Van Nguyen made the finals of all the events at the 14 and under Teen Tennis in Bolton, England. After eliminating the No. 2 seed Irina Khromacheva of Russia 7-5,6-0 in the semis, Grace lost to No. 3 seeded Russian Polina Leikina, 6-2,6-2. In the doubles, Kyle & Chanelle dropped the last match to Polina & Margarita Gasparyan, 6-3,6-3. Nina Munch-Soegaard (pictured, right) of TCU was named the Tennis Athlete of the Year by the Texas Panhandle Sports Hall of Fame. Nina was one of eight athletes with roots in the Panhandle area to be named a player of the year. Memphis’ Amrit Narasimhan and Marshall's Kellie Schmitt have been named the Conference USA Tennis Players of the Week. United States Fed Cup Captain Zina Garrison will be blogging from the team's quarterfinal match in San Diego. If you have any questions or comments for her, write to fans@usta.com. The Baylor men's team managed to accomplish three perfect scores during a January 26th triple-header. The Bears went through Prairie A&M, Southeastern Louisiana and Texas-Arlington with 7-0 scores. College Sports Television (CSTV) and CBS Sports are introducing the new FANS ONLY, a community of sports news, scores and stats from over 5,000 sources. Visit Fans Only to register. DTL Down The Line Sportswear is a new brand of tennis and fitness apparel for women and juniors that has an emphasis on clothes designed for a younger market. The company uses high-performance fabrics and is professionally designed and manufactured in the U.S.. The line stays under $40 with pieces starting at just $25.99. For more information, visit the DTL Web site at http://www.dtlsport.com. Former California State-Long Beach player Terry Rhodes, who is now a real estate lawyer, has pledged a $1.25 million gift for the construction of a new campus tennis facility and the establishment of an endowed scholarship fund for tennis players at his former school. Georgia once again ruled the SEC Indoor Championship. Bulldog Luis Flores defeated Ivan Bjelica of Mississippi State, 6-4,6-7(2),6-4 for the singles trophy. North Carolina made a great showing at the Duke Invitational. Duke's Kiril Dimitrov won the singles championship with a victory over North Carolina’s Benjamin Carlotti, but the Tar Heel team of Clay Donato & Stefan Hardy earned the doubles win. Indiana women's head coach Lin Loring reached a milestone this weekend when he earned the 700th coaching win of his career. Coach Loring is now the top all-time winner in NCAA Division I women's tennis. The majority of those wins (658) came with the Hoosiers. He is in his 31st season in Indiana. Boise State University earned the Mountain wildcard into the ITA National Team Indoors with a 4-3 victory over New Mexico in the playoff. The Tim & Tom Gullikson Foundation is participating in America's Giving Challenge, an internet-based fundraising challenge sponsored by The Case Foundation and Parade Magazine. A $50,000 Grand Prize grant will be awarded to the four U.S.-based charities who attract the greatest number of unique donors to their cause. The deadline is January 31st. If you'd like to lend a hand to brain tumor patients and help the Tim & Tom Gullickson Foundation earn one of the $50,000 Grand Prizes, click on http://www.networkforgood.org/pca/Badge.aspx?BadgeId=109267 and make a fully deductible $10 donation. Both of last year's NCAA Division I champions proved themselves at the USTA Pro Circuit tournament in Tampa. Somdev Devvarman, who was playing as an amateur as he is still on the University of Virginia team, was the men's singles and doubles winner (with teammate Treat Huey). 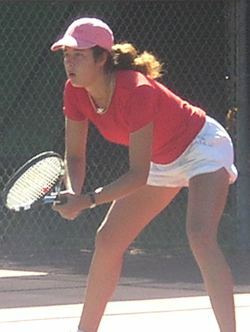 Audra Cohen made it to the singles final before falling to Anastasia Pivovarova. Audra did not return to the University of Miami for her final year. Stephanie Vogt of Liechtenstein swept the titles at the Copa Gatorade in Venezuela, winning the doubles with Polana Hercog of Slovenia. Alexandre Folie of Belgium was the boys singles winner and Ricardo Belotti & Mark Kovacs won boys doubles. Four former University of Illinois players made it through professional Qualifying events last week. GD Jones survived at the Heineken Open to become the first player from New Zealand to qualify there in 22 years before falling to Nicolas Massu. At the Australian Open, Kevin Anderson, Amer Delic & Rajeev Ram were among the sixteen players qualifying for the men's singles. Kevin lost 7-5 in a fifth set to Alejandro Falla yesterday. To follow Amer & Rajeev's progress today, visit http://www.Australian Open.org. Jim Courier is commentating for the Australian Open this year and is encouraging fans to send in any questions they would like him to ask players during post-match interviews. If you would like to participate, visit http://www.ChampionsSeriesTennis.com and go to the "Fan Zone" section, where you will see the "Player Q and A" to submit questions. The ITF tournaments have begun in Australia, as juniors warm up for the upcoming Slam. Jared Easton used the homecourt advantage to take the boys singles title at the Traralgon ITF and Cindy Chala won the girls. In doubles it was Ryan Harrison & Matt Reid and Chen Astrugo & Bianca Swanepoel. Dr. Mark Kovacs has been named the Manager, USTA Sport Science. 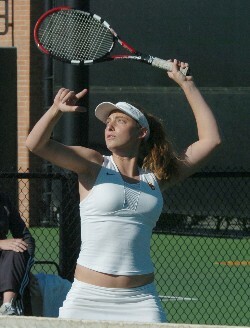 Dr. Kovacs is a former top junior who was an NCAA doubles champion while playing for Auburn. After college tennis days were over, he earned a Master of Education in Exercise Science and then a Ph.D. in Exercise Physiology. Stanford was the big winner at the Freeman Memorial Tennis Championships in Las Vegas. It was Southern California's Amanda Fink who won the Flight One Singles after defeating Katrina Tsang of North Carolina, 6-2,2-6,6-1, but the rest was all Stanford. Jessica Nguyen & Whitney Deason took out UCLA's Ashley Joelson & Alex McGoodwin, 8-2, in that flight's doubles. In the Flight Two finals, Lejla Hodzic defeated Amanda Martin of Arizona State, 6-1,6-2, while teammates Lejla Hodzic & Jennifer Yen were the doubles winners over Arizona State's Ashlee Brown & Lauren Megale, 8-4. The Residences at The Ritz-Carlton, Grand Cayman, will host a new Outback Champions Series event April 16-20, 2008. The players participating in the Champion Series have all reached at least a Grand Slam event singles final, been ranked in the top five in the world or played on a championship Davis Cup team. All Champion Series events feature eight-man round-robin formats with the winner of each four-player division meeting in the title match and the second place finishers in each division meeting inthe third-place match. Volunteers are needed for the Family Circle Cup, April 12th-20th. For more information, call (843) 856-7900 or visit http://www.familycirclecup.com. USTA National Coaches Kent Kinnear and Jai DiLouie will coach the boys and girls. The USTA Tennis & Education Foundation Scholarship Applications are available for 2008. The Foundation offers a number of college scholarships to graduating seniors. Applications must be returned by February 8, 2008. 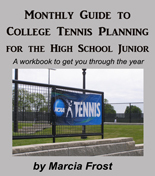 They are available at http://www.usta.com/communitytennis/ along with detailed information on the available awards. In the finals of Mexico's Copa Casablanca, the home country's Cesar Ramirez prevailed in the boys singles over Alexei Grigorov of Russia, 6-4,3-6,6-0. Bulgaria's Tanya Raykova defeated Tamaryn Hendler of Belgium in the girls, 6-4,7-6(5). Americans did well in doubles with Krista Damico & Nadja Gilchrist (pictured left) winning over Tamaryn & Ajla Tomlijanovic, while Evan King & Raymond Sarmiento made it to the finals before falling to Alfredo Moreno & Manuel Sanchez Montemayor. As of January 1st, the ITF adopted a change in the doubles format for Grade A and Grade 1 events. All doubles matches will be played with No-Ad scoring. There will also be a Match Tie-Break of 10 points played instead of a third set.